Say goodbye to the 45° corner welds for good with our innovative new timber look corners! FAB NEW TIMBER LOOK CORNERS ON OUR EVOLUTION WINDOWS MAKE IT EVEN HARDER TO SPOT THAT THESE STUNNING WINDOWS AREN’T REALLY WOOD! We’re really excited about this latest innovation from Evolution! Gone are the telltail 45° corner heat weld marks that are so characteristic of your average uPVC window! Original discreet 45° weld marks on the exterior vents of an Evolution Storm 2 window (left) compared with the new innovative timber-look corners. Woodgrain effect foils have got so good now that it can sometimes be difficult to tell if a profile is uPVC, until you touch it, that is. However if there was one sure giveaway sign that a window was uPVC it was always the 45° corner heat weld marks that could be found all across the vents and joints. You simply don’t get these on a genuine timber window. Customers love the look of timber but don’t want the maintenance issues. uPVC offered woodgrain foils, but it still didn’t look like a genuine timber window. Enter Evolution Manufacturing, with the ground breaking STORM timber replacement window. Evolution took on board the differences in construction between a uPVC window and a timber window, and worked hard to create a new window that embraced the age old techniques of wood, but with all the benefits of uPVC. It wasn’t always easy but with hard work and innovation they created the STORM window which took the humble uPVC window to brand new heights. Now, combining the aesthetics of a hand finished mechanical construction timber window with exceptional energy performance meant that customers could finally have a uPVC window that really could give a genuine timber window a run for its money! Interior of an Evolution window. 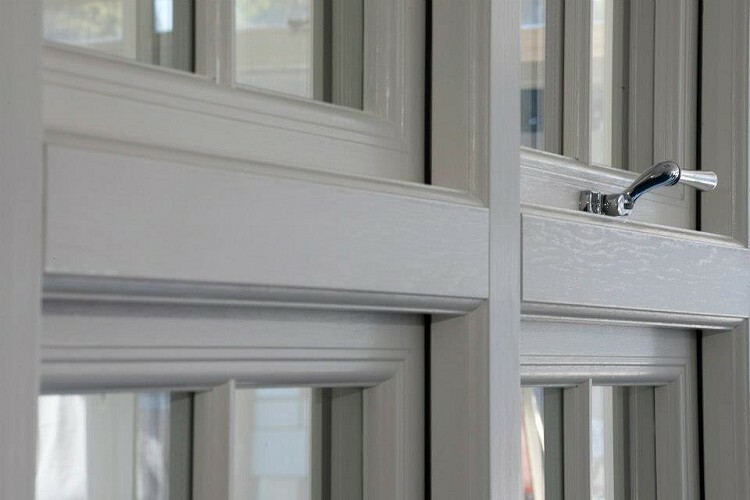 The mechanical construction looks much more like the aesthetics of a genuine timber window than your average uPVC window does. It wasn’t long before Evolution were busy working on their next innovation – the Flush window. Once again, this window replicated a genuine timber window like no other. Flush fitting casements that looked just like wood but with all the benefits of uPVC were now possible, and our customers were loving it! Fab looking Flush casements with very discreet 45° weld marks to the corners of the vents. Now, we can finally kiss goodbye to the 45° corner weld altogether with the introduction of the brand new timber-look corners. This subtle but ground breaking design feature has taken the Evolution timber alternative window to even dizzier new heights! COMPARE THE CORNERS: Our standard Rehau uPVC window (left) and the Evolution Storm timber alternative window (right). Contact us at our showroom in Bushey Arches if you’d like to find out more about our Evolution timber alternative windows and doors, or check out our brochures and video page where you can download our latest Evolution brochures.